The red-eared slider turtle (Trachemys scripta elegans) is a subspecies of the pond or common slider (T. scripta). It is not native to Australia, but has established isolated populations here as well as in other countries. The red-eared slider has significant potential to spread further in Australia, so it is important to report any found in the wild. The adult red-eared slider is a medium-sized freshwater turtle with a carapace (upper shell) length of 12.5-28cm. It has a distinctive, broad red or orange stripe behind each eye, while narrow yellow stripes mark the rest of the head and legs. The carapace is dark green with yellow markings, and the plastron (under shell) is yellow with some dark rings, blotches or swirls. Some individuals have dark pigment that covers their coloured markings so that they appear nearly black in colour. The red or orange eye-stripe can also be absent or not visible in some individuals. Male sliders are usually smaller than females, and have very long claws on the front feet. The young hatchlings are about 3cm in length, have a green carapace and a yellow plastron dotted with numerous dark, eye-like spots. Some Australian freshwater turtles can be mistaken for sliders, but there are some important differences. Slider carapaces are dome-shaped whereas those of native turtles are fairly flat. 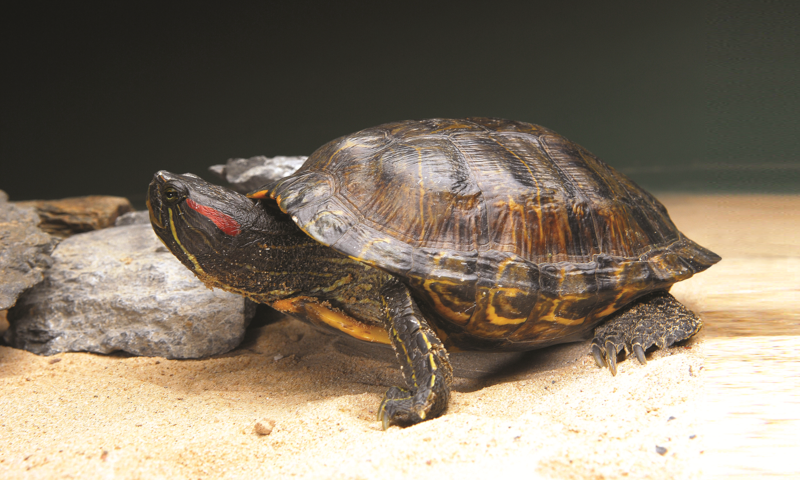 In addition, native turtles do not have the long claws typical of male red-eared sliders. When threatened, a native turtle retracts its head by folding its neck sideways into the shell, whereas the red-eared slider retracts its head by pulling it straight back into the shell. Murray river turtle (occurs in south-eastern Australia).